Communication – verbal or non-verbal – is fundamental to all aspects of life but unfortunately many people who suffer a brain injury will find their ability to communicate and to be understood compromised. Problems with speech, language and communication can lead to frustration and to isolation. 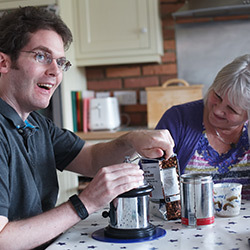 In this issue, we look at how people can be supported to adapt communication post-injury and at some of the therapies and aids that might ensure that the injured person remains connected to the world they know. Consultant speech, language and cognitive therapist Lisa Harris considers how brain injury impacts the communication dynamic and how individuals and families can be helped in order to maintain their relationships on page 3. Arts-based therapies are increasingly used to complement mainstream therapies when it comes to effective communication. Music therapist Daniel Thomas shows the value that music, art and drama therapy can add to rehabilitation on page 6. Complex injury and negligence claims can take years to process. Clinical negligence specialist Julia Hurlbut outlines the communication touchpoints and skills required to keep all parties in the loop and progress a complex claim on page 9. An inability to communicate is most definitely not the same as an inability to understand. Capacity assessment expert Tim Farmer explains how only be keeping sight of the individual can you work out how best to support and communicate with them on page 11. Mick Davies looks at how technology can help people with communication disorders to join in the conversation on page 12. Managing a team of seasoned professionals for the benefit of one individual and their family requires very specific communication skills and is as much about what isn’t said as what is. Case manager Helen Ovans considers what good communication looks like on page 14. 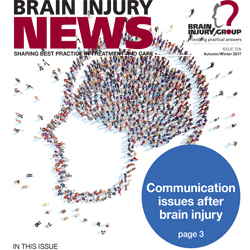 View the Autumn/Winter 2017 edition of Brain Injury News through the link below. Communication – verbal or non-verbal - is fundamental to all aspects of life but unfortunately many people who suffer a brain injury will find their ability to communicate and to be understood compromised. Problems with speech, language and communication can lead to frustration and to isolation. Brain Injury News is free and published up to three times a year. To receive a copy direct to your inbox or to request a printed copy, please complete the form below. You can also download previous copies of Brain Injury News below. Employment contributes to our wellbeing and sense of ‘self’ but many of those suffering brain injury find their capacity to return to a previous occupation compromised. In this edition we look at the importance of work within rehabilitation, how a return to work might be supported and managed, and what to think about if you employ a care team. Given the scale of international travel for leisure and work, if a catastrophic injury occurs overseas how does an individual access care and support? In this ‘Travel’ edition we look at some of the issues around suffering an injury abroad, the impact of which could be exaggerated by language, culture, cost and unfamiliar systems. Whilst the effects of a brain injury can be devastating for the individual concerned, that injury will also impact their family and friends for years to come. In this ‘Family’ edition we look at how families can be supported to accept, adapt and adjust following brain injury. The wide ranging effects of brain injury mean that the issues of capacity and consent are particularly pertinent for the individuals affected and those caring for them. In this edition we consider the complexities of assessing capacity and of decision making. With increasing evidence linking brain injury and criminal behaviour, this issue looks at how those affected by brain injury are treated within the criminal justice system – both as witnesses and defendants. Considers the positive impact of working collaboratively to achieve the best rehabilitation outcome, including legal and insurance professionals working within the framework of the Rehabilitation Code. Takes a look at some of the ongoing disorders associated with brain injury such as aphasia and epilepsy and the techniques used to identify and address them. Looks specifically at the challenges presented by childhood brain injuries from birth to adolescence and how best to tackle them. Considers cognitive impairment in older brain injury patients, and the legal and ethical issues around treating patients with disorders of consciousness.